Our 2018 Extra Virgin Solemare Olive Oil comes from the Costa Etrusca, near the Bolgheri region of Tuscany, famous for the wines but also well known for the production of quality olive oil. Solemare has been warmed by the sun and kissed by the sea, is unfiltered (like all our olive oils) and has a rich fruitiness with scents of artichoke and chicory, a flavor mid pallete with hints of salt and herbs and a rounded long finish of sweet almonds. It simply is delicious! The label features the blue of the sea and a mosaic version of our angel. Our Solemare Extra Virgin Olive Oil was harvested in mid-October. The olives have been harvested gently and pressed at a small local frantoio (olive mill) that uses the latest technology to preserve the nuances of the olives. 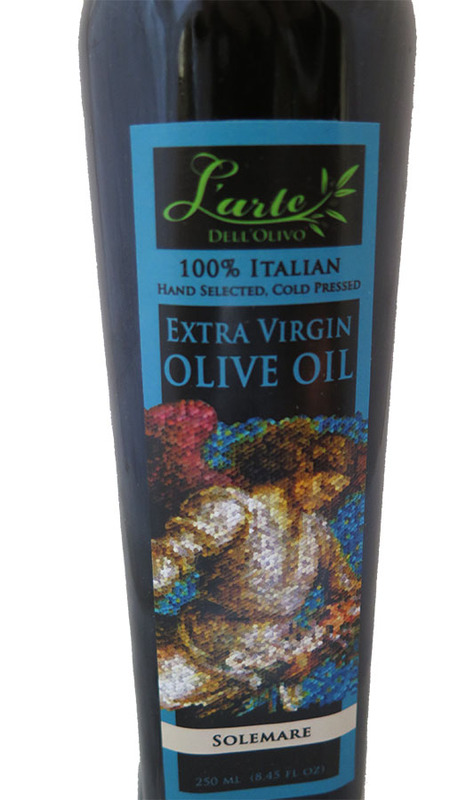 Over time it is normal for this olive oil to have some sediment at the bottom of the bottle. This just assures you that it has been bottled very quickly after pressing to preserve the fresh taste. At first the taste will be very intense, mellowing out over time and naturally clearing to a transparent chartreuse color. Each bottle is 250ml. If you would like to order more than 5 bottles, please order using the CASE item. Copyright L'Arte dell'Olivo. All Rights Reserved.